And we have finally made it to the winter vacation! While work has been extremely tedious and frustrating, I was able to get everything in order so I can start to relax and enjoy the holiday. Tomorrow begins the tradition that is Christmas and Hanukkah together. Every year, I end up in a whirlwind between the houses. Starting on Christmas Eve, I go to my mom’s house for dinner, which sometimes will include my stepdad’s family. On years like this one, football gets to be included in the festivities. The night culminates with a fantastic dinner and the start of our gift exchange. Though we focus mostly on the stockings, there is sometimes a small exchange between us siblings because they cannot wait to give their gifts. The next day bring the true whirlwind adventure. Starting from my mm’s house, I travel to my dad’s and open gifts with him and the sisters. These leads to the group of us traveling down to my grandmother’s for Christmas breakfast, which includes chipped beef and gravy. While not a big fan, it is one of those family traditions. We head back to be dad’s to then go back to my mom’s. At this point, it is at least 11am, if not 1pm. We do the gift opening there too, but the day already feels long so there is a family napping session. That evening, we head back to my dad’s and have a Christmas dinner (though this year it will be at my sister’s). 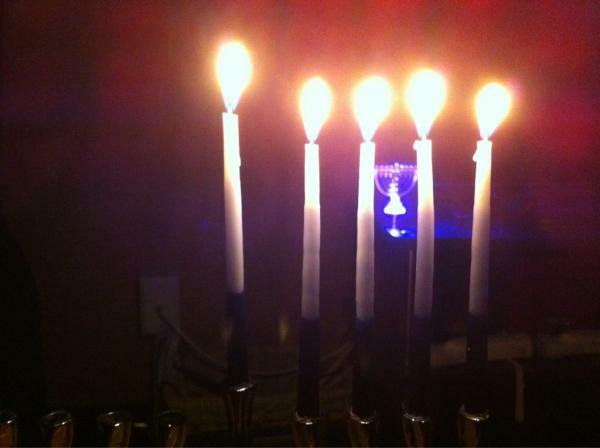 This craziness highlights a very important aspect of my family: we celebrate both Hanukkah and Christmas. While only the former is filled with culture and tradition, the latter is in the spirit of the holiday season. I admit to loving the Christmas spirit and the beauty of the symbols but I do not hold any religious connection to the day. The spirit of giving and family are what drives many families to inherit the traditions. For Hanukkah, I feel some of the similar elements of togetherness and family, but I also feel that significance of my culture and its celebration. Tomorrow begins the excitement, so I should probably get some sleep.